Dr. Bernard Harris and the ExxonMobil Foundation have partnered together since 2006 to provide math and science camps to underserved students across the country in an effort to close the learning gap and encourage youth to pursue science, technology, engineering and math (STEM) careers. 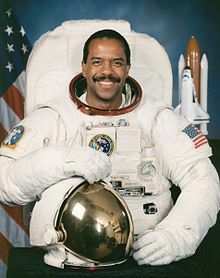 More than twenty years ago, Dr. Bernard Harris Jr. made history when he stepped out of the space shuttle Discovery and became the first African American to walk in space. On that day, Dr. Harris set a course for youngsters everywhere to follow his example of what people can achieve through dedication, commitment and a thirst for learning. Today, he continues his trailblazing ways, and ExxonMobil is a proud partner with Dr. Harris on his Earthly mission – to inspire middle-school students about the possibilities of math and science and where education can take them – if they dare to dream.